Recent graduates from the BCIT Civil Engineering Bachelor’s Degree program, Danielle King and Harrison Dowd, aim to put their studies to use by working as Earthquake Engineering Interns in Kathmandu, Nepal. They hope to make an impact in providing earthquake resilient designs at local engineering firm Earthquake Safety Solutions (ESS). Danielle’s first blog post is below. More stories of their adventures in Kathmandu can be found in their byline above or this link. I arrived in Kathmandu, Nepal about one week after my colleague Harrison Dowd because I was fortunate enough to be travelling around Europe with my partner! Thankfully, the time change from Europe to Kathmandu was only about 4 hours because the day after my arrival was the first day of work at Earthquake Safety Solutions (ESS). Our first day of work at ESS happened to be their fourth-year anniversary “ESS Day”, which provided a great opportunity to meet our new co-workers. As part of ESS Day, Dev Kumar Maharjan, CEO, presented ESS’s accomplishments and plans for the future. This gave us the opportunity to learn more about ESS! Earthquake Safety Solutions (ESS) is a social entrepreneurship engineering firm that is registered with the Government of Nepal as a “company not distributing profit”. 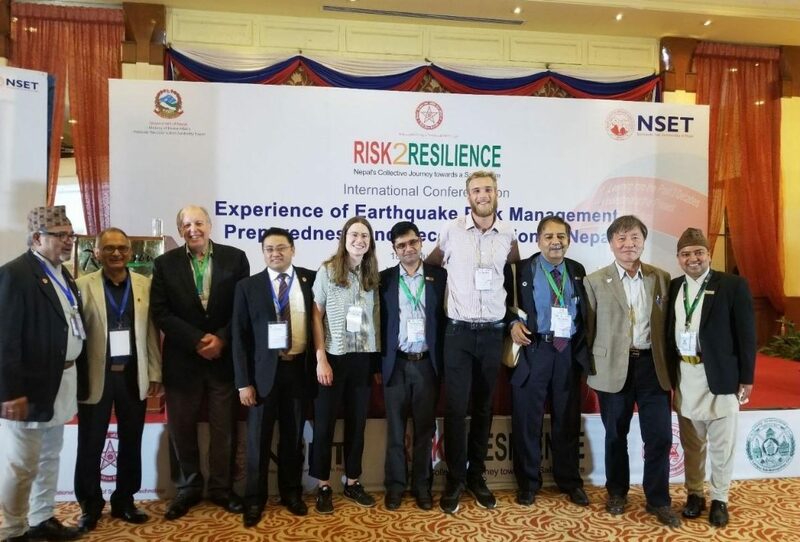 The company was founded by a small group of engineers who previously worked for the National Society for Earthquake Technology (NSET), which is Nepal’s leading institution working towards earthquake risk management. ESS’s main goals are to reduce the earthquake risk of existing structures, promote safer building construction, and help communities build earthquake resilience through raising awareness, capacity building and preparedness. The first week of work passed by quickly as we adjusted to the new work routine and began familiarizing ourselves with the Nepal Building Code and Indian Standard Code, which is commonly used in Nepal as well. At the end of the week, we were asked to brainstorm previous works we had done and try to adapt it to the upcoming Risk2Resilience conference that centers around the theme of enhancing disaster resilience in Nepal. Since neither of us had done any work surrounding this theme we decided to research a new topic despite the impending deadline being one week away. A few inspiring articles later, researched a new developing technology – scrap tire rubber pads which can be used as base isolators in typical Nepali low-rise buildings. We presented our research at the Risk2Resilience conference Young Scientists Forum and plan to complete our research during our internship at ESS. We are hopeful that this technology will provide an affordable option that Nepal and other developing countries could use to improve their building’s earthquake resilience. We also had the opportunity to attend all three days of the Risk2Resilience conference that was hosted by the National Society for Earthquake Technology (NSET). This was an invaluable learning experience that exposed us to disaster risk management from the varied perspectives of researchers, seismologists, engineers and social scientists. BCIT Civil Engineering instructor, Dr. Bishnu Hari Pandey, also attended and presented at the Risk2Resilience conference. For the final day of the Risk2Resilience conference we participated in a field visit to Kageshwori Manahara Municipality to observe earthquake reconstruction of its approximate 60,000 residents. It was impressive to see the Municipality’s progress despite the financial, social and resource access issues they face. Most homes were damaged in the Gorkha earthquake due to their weak lateral resisting structure made of adobe, stone masonry or unreinforced brick. 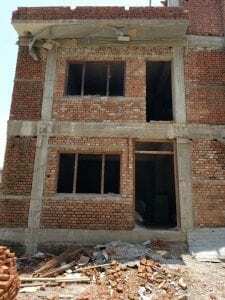 The reconstruction work is focused on building earthquake resilient homes by either retrofitting existing homes, or by building new homes of reinforced masonry or reinforced concrete moment frames that are based on government approved designs in compliance with the Nepal Building Code. The Municipality has been assigned four full-time engineers and a structural engineer consultant to help oversee construction and ensure that the building code is properly implemented. NSET is also assisting with reconstruction efforts, including training masons in earthquake resilient construction methods. Reconstruction on such a large scale does not come without its challenges. The large scale of reconstruction and few engineers at the Municipality has resulted in some building code non-compliances. As you can see in picture to the right, this structure has an unfavourable strong-beam, weak-column failure mechanism and a load-path discontinuity due to the columns not being at the edge of the building. Regardless of some reconstruction shortcomings, the Municipality is doing the best they can with the available resources and is still building improved earthquake resilient homes!